Mother\'s Day Event is specially designed for celebrating this great festival all over the world. 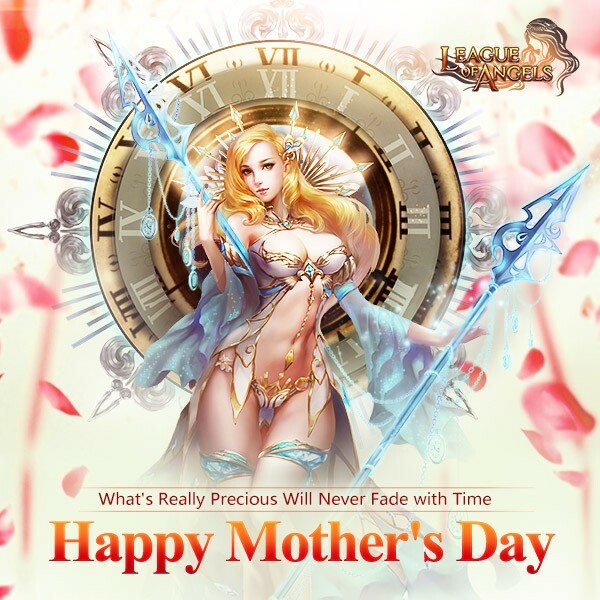 Although May 10 is over, but we would like to make it a longer time in game, which reminds us that our affection for mother is not limited within one singel day, actually it should last forever. 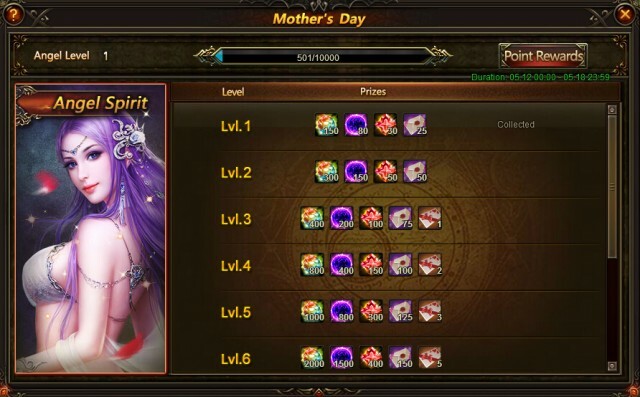 This is the button of Mother\'s Day event, click it. Ready? Let\'s go! Click the icon of Mother\'s Day and you will see four parts. 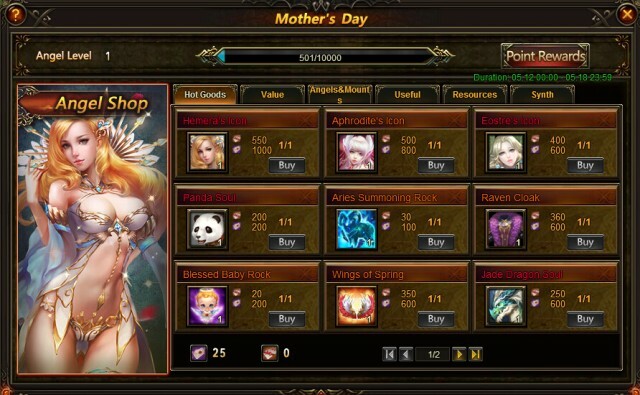 They are Angel Spirit, World Boss, Angel Chest, and Angel Shop. Fight together and get great rewards here! Click Angel Spirit you will see this panel. When Angel Spirit EXP reach certain amount, all players in this server can collect the rewards. 1. Every Gratitude Card acquired will earn a player 1 personal point and increase the Angel Spirit\'s EXP by 1. Every Fine Gratitude Card acquired will earn a player 2 personal points and increase the Easter Spirit\'s EXP by 2. 3. All Angel Spirit level rewards can be collected once daily when available. 4. Join the World Boss during the event for a chance to receive Gratitude Cards. The top 50 in World Boss ranking have a chance to receive Gratitude Cards and Fine Gratitude Cards! Resources, Teasure Hunt Chests and Gratitude Cards are waiting for you in Gift Boxes! 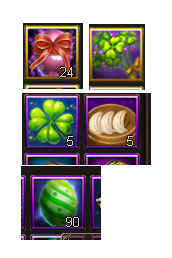 You can randomly get one of the following items by sacrificing one kind of Carnation. There are 3 kinds of gift boxes. You have to sacrifice Carnation to open them. You can get Carnation, Twin Carnation, Carnation Bouquet through hot events or use diamonds to buy. You may ask, how to deal with the Gratitude Cards I have got? Ok, here comes a chance for you to exchange items by Gratitude Cards! Here you can get mount Panda, Jade Dragon, Pheonix, Lumious Steed,angel Hemera, Aphrodite, Eostre, Elena, Fairy Blessed Baby, Clothing Elvish Spring, Wings of Spring, and many more other items! Description: Complete daily challenges to collect Fine Gratitude Cards! Description: Complete daily challenges to collect Gratitude Cards! Description: Collect enough Gratitude Cards and Carnations to get rare items! Description: Cumulatively recharge certain amount to get excellent Gems, crystal, and Carnations! 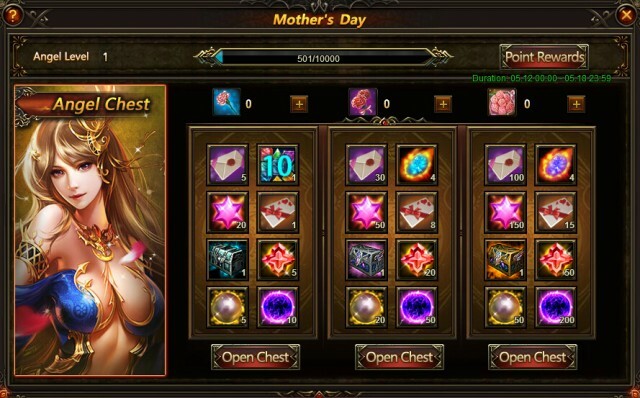 Description: Recharge certain amount of diamonds to get items for Mother\'s Day Event! Description: Log in everyday to collect Carnations! [colorDescription: Complete daily challenges to get rewards. More exciting events are coming up through May 12 to May 18 (server time), check them out in the in-game Hot Events menu! Really again only rewards for donaters Where is Consuming resourse for f2p not here; Just no coment keep facking us ..
And what the hell are we supposed to do with these golden eggs just taking up inventory space?!?!? CONSUME is a must. Not only for f2p. I recharge and I really want consume. This event is just boring without it. And, like everybody else said, YES, exchange for previous event materials. And, yes, Little Snow Queen as well. was this on gidgiddoni 936 cause I didn\'t see any icons ? Please can we have an exchange for the items left from the last one?? 2019-4-19 07:11 GMT+8 , Processed in 0.074493 second(s), 52 queries .